The Aerocut Prime is an ideal solution for finishing, especially for short-run digitally printed applications, such as business cards, post cards, invitations, greeting cards, leaflets, tickets and more. The complete package with Lytrod Intellicut imposition software offers full versatility and convenience for simple and efficient production. The Prime has the capability to perforate stocks both across and along feeding direction by adding on an optional perforating unit. Flex mode allows operators to cut multiple size cards from a page and add the desired number of creases on these; It enables designers and printers to create new aspects of applications. The Prime saves time and costs for any print shop, in-house printer, commercial printer, etc. The air-suction top feeding system easily feeds coated, digital, gloss and other stocks precisely without damage. Included is the new Lytrod Intellicut software to easily impose artwork + address data to seamlessly create PDF layouts with job barcodes and cut marks for the Prime. The 7” touch screen allows operators to set job programs and run the machine intuitively and instantly. The expandable tray is capable of feeding stocks up to 26.75” in length. Most stocks for today’s digital print can be finished on the Prime. The stacking capacity is 4”. The patented “Tri-Suction Feeding Mechanism” reduces risks of double feeds and mis-feeds drastically, therefore it prevents paper jams and enhances productivity. 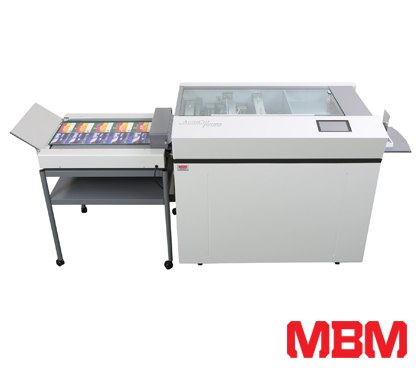 The self-sharpening slitter and blade unit allows the machine to cut up to 400 gsm. The conveyor is light weight and easy to attach. It's engineered to adjust for different stock and sizes of finished pieces. The Prime now has detachable rollers, not only making cleaning easy, but it gives better access to components in case of a paper jam. Machine Size: 30.3" D x 57.6" W (not inlcluding exit conveyor) x 41.1" H / Shipping Weight: 573 lbs.